Primary and secondary school students in years 3-10 from across the CQ region gathered to demonstrate their skills at designing, building and coding robots recently. Participants competed for several awards including GRC (Grit, Resilience and Cooperation) Champions, Most Enthusiastic and Innovative, Best Robot Design, Most Improved, and Best Team Spirit. Students competed in either the beginner ‘alumina transport’ challenge or advanced ‘alumina transport and refinement’ challenge division. In the competition, teams coded their robots to race against the clock to follow the transportation pathway of bauxite from Rio Tinto’s mining operations in the Gulf of Carpentaria to be processed into alumina at the Queensland Alumina Limited (QAL) and Rio Tinto Yarwun refineries. This pathway is represented on industry themed mats. The bauxite-alumina corridor is represented by a black line and student encountered real-life obstacles along the way. Advanced division students completed the beginner transport mat and took the next step of designing additional attachments and programming to mimic the process of bauxite moving through the Bayer Process to be refined into alumina, including spins during digestion and the pushing of the waste slurry to the red mud dam during clarification. Preparing for this competition has been no mean feat for students or for their teachers. Participating students have spent several weeks designing their robots and coding them to sense their surroundings by using colour-detecting and ultra-sonic (sonar) sensors that are manually attached to the robot. Mentors from QAL and Rio Tinto Yarwun have been visiting the many schools competing in the event, sharing their STEM thinking, problem-solving and coding knowledge with students. 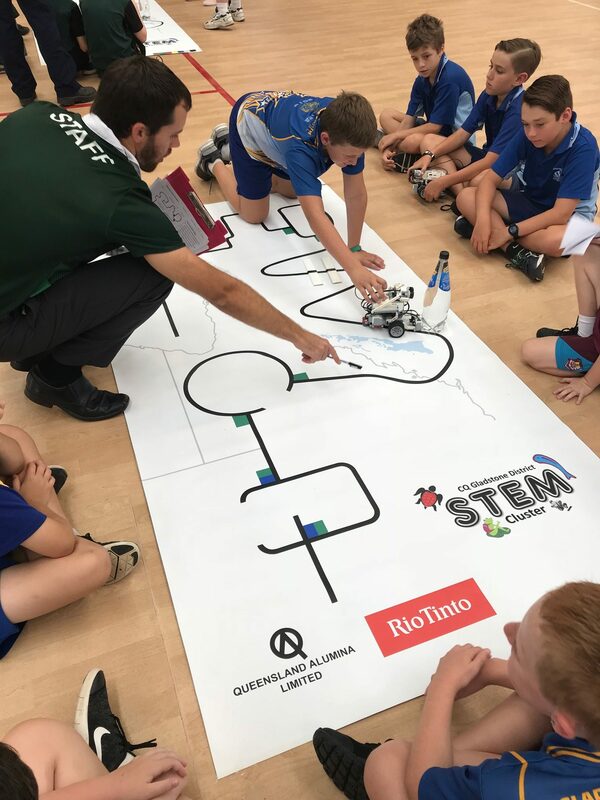 The industry-themed mats for Gladstone Robotics Competition have been generously funded through Rio Tinto’s Community Sponsorships Program, and development of the mats has been a collaborative effort between local teachers and engineers from QAL and Rio Tinto Yarwun. According to Dr Carol Devney, an event organiser, Rio Tinto’s generous financial and in-kind contributions have provided a platform for real-world processes to spur student interest in STEM. “Students are excited not only about the competition, but also they are gaining invaluable experiences through seeing potential career pathways first-hand as they engage with the robotics challenges and the professional mentors,” she said.